Irritable Bowel Syndrome (IBS) continues to frustrate many a sufferer and health professional alike: as research is leading multiple therapeutic directions, it can be very challenging to accurately target therapies and nutritional interventions for the patient. One very promising direction is the role of small intestinal bacterial overgrowth, or SIBO, in the origin or at least the progression of IBS symptoms. 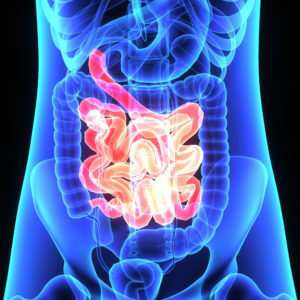 While the colon is supposed to be rich in beneficial microbes, the small intestine should have a very low volume of bacteria. In SIBO, that number greatly increases so that fermentation occurs within the small intestine, leading to excessive gas and bloating. In addition, the presence of these microbes can increase systemic inflammation and alter the normal function of the digestive tract. What can cause this change? There are many potential causes, including a change to the normal motility of the digestive tract and a lack of acidity in the stomach. The preferred method for diagnosing SIBO is a culture of the fluid of the small intestine but because this test is invasive, the hydrogen breath test is the more typical diagnostic. In this test, the presence of hydrogen in the breath is a measure of expected bacterial fermentation. The challenge with diagnosis is that no standardized diagnostic procedure has been agreed upon. Studies have found measures of SIBO anywhere between 4-78% of patients with IBS, which is likely due to the different diagnostic procedures and criteria. One recent study found that 45.7% of patients with diarrhea-predominant IBS tested positive for SIBO. Breath testing may lead to slightly higher diagnostic numbers that small intestinal culture1. Treatment for SIBO also varies, depending on the practitioner. In many countries, excluding Canada, rifaximin has been used with success in eradicating SIBO1,2. Rifaximin is a unique broad-spectrum antibiotic that is not well absorbed and as such, remains mostly within the gut space. In addition, dietary regimes like paleo and low FODMAPS eliminations have the potential to impact the communities of bacteria within the digestive tract. There are also botanical options for lowering intestinal bacteria in the absence of rifaximin treatment, such as garlic and oil of oregano. Of course, administering a clinical-strength probiotic whenever dysbiosis is present is advisable. Small intestinal bacterial overgrowth is one intriguing pathway to improving the symptoms of irritable bowel syndrome but it is important to remember that root causes and therapeutics for IBS needs to be individualized with the help of your healthcare team. Need help initiating a sound dietary strategy for diagnosed SIBO or IBS? Talk to one of our nutritionists for one-on-one guidance. Ghoshal, Uday C., et al. “Breath tests in the diagnosis of small intestinal bacterial overgrowth in patients with irritable bowel syndrome in comparison with quantitative upper gut aspirate culture.” European journal of gastroenterology & hepatology 26.7 (2014): 753-760. MORARU¹, IOANA G., et al. “Small Intestinal Bacterial Overgrowth is Associated to Symptoms in Irritable Bowel Syndrome. Evidence from a Multicentre Study in Romania. Small Intestinal Bacterial Overgrowth and Irritable Bowel Syndrome.” ROM. J. INTERN. MED 53.3 (2014): 143-150. Halmos, Emma P., et al. “Diets that differ in their FODMAP content alter the colonic luminal microenvironment.” Gut (2014): gutjnl-2014.